I have to tell you that the first time my aunt told me to purchase a pork tenderloin in the bag to cut into pork chops I wasn’t really sure about this. It is a big piece of meat and doesn’t look to appealing in this form. 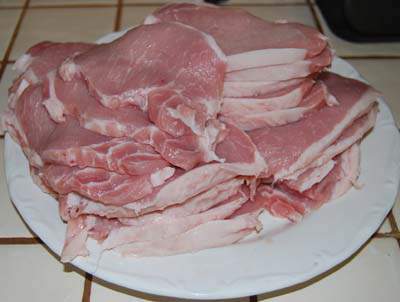 But now years later and many time of cutting my own pork chops and roast it is really easy. 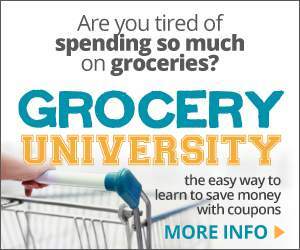 So believe me when I say it is not that bad to do this and you can save a lot of money. I purchase my whole tenderloin packaged just like this above pictured at Costco from $1.99 to $2.19 a pound and recently they had them on sale at Safeway for $1.99 per pound. The first thing I do is cover my counter top I will be working at with plastic wrap. I do this to make clean up easier but you don’t have to. Then I get out my cutting board to use and place it on the counter. 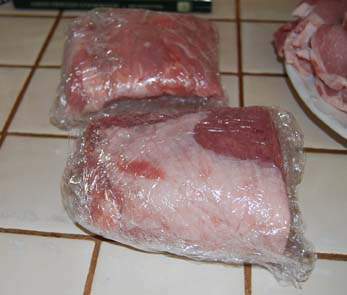 Once I am ready I put the pork tenderloin in the sink and cut one end open and drain off any juice in the package. It saves it from running all over your counter and onto the floor. Don’t ask me how I know. The first thing I do after taking it out of the packaging is to cut off each end for two pork roasts. Like pictured below. I wrap them in plastic wrap and then put them into a freezer bag. These are great cooked up in the crock pot. The part you have left is the middle and I just start cutting it into slices for pork chops. We like thin pork chops so we get quite a few if you like thicker pork chops just cut them thicker. You could even cut some thicker for certain recipes and thinner for other recipes, whatever you need. I usually package the pork chops 5 to a package. I find that 5 pork chops will fit nicely into one sandwich bag. Once they are all in the sandwich bags I put those into a gallon sized Ziploc freezer bag. By doing all the prep now you can get out just the right amount you need right out of the freezer without too much hassle. Here is my plate of pork chops along with the wrapped up pork roast and a few I kept out for our dinner. 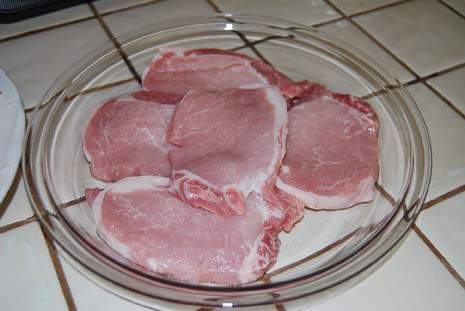 You can use the pork chops in any recipe you have. We like to marinate them and grill them. I also have a recipe my great grandma used to make with pork chops and I will post that next week. So the next time you see that big package of pork tenderloin on sale go ahead and pick one up. You can cut it up yourself and save some money over pre-packaged pork chops. What do you think? Is this something you might try? I’ve been following your blog via twitter for months now, and finally have to comment! This is such a great tip that I never would have thought of. I can’t wait to try this out! Thanks so much for sharing. I’ll pin this to Pinterest also! I am so glad you like this idea. It has been great for saving money on pork chops and roasts. I forgot to add you can also cube some of the pork for kabobs or thinly slice some for stir fry dishes. Let me know how this works for you if you give it a try. Also thanks for the pin. If you like butterfly chops you can cut them also. Turn the loin so the fatty side is down, cut into the loin the thickness you want your chop but don’t cut all the way thru, then make another cut same thickness as the first, this time cutting all the way thru. You might have to cut a bit to get it to lay flat, but that’s a butterfly chop. I used to make these, but now half of one is a better portion size for us. Thanks for sharing your tip on making butterfly chops, Regina. I’ll have to give it a try.